Finally, I found the two things I've been looking for! 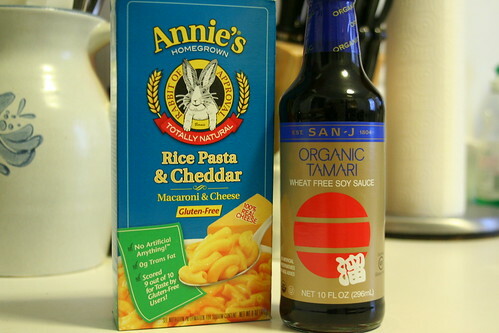 Gluten free mac & cheese and gluten free tamari! All this time I've been shopping at the Stop & Shop right across the street from my house but today I finally ventured up the street to the next available location. This other one is SO much better! They have a huge natural foods section (well it's one isle but it's still better than the other one) and imagine my delight when I found the GF Mac & Cheese and Tamari, as well as a bunch of other things I haven't been able to find at the other S&S. I had a pound of ground beef to cook tonight so I split it in half and made half of it into pasta sauce and half of it into taco meat. My roommate and I ate the tacos for dinner and then after dinner I put on a put of water to boil to cook some pasta to go with the sauce so I could take it for lunch tomorrow. Well don't you know, I walked away from the water and went in the living room to do my homework for Photoshop class and completely forgot about it. The roomie and I decided it was too nice out to sit in the house so we went to sit outside for a few and she walks into the kitchen and I hear... "um, Jenny? Were you trying to cook something?" Yeah... I completely boiled the water right out of the pan and had a smoking hot pan of nothing. OOPS!!! So right now I have leftover tacos for lunch tomorrow and I'll have to cook the pasta later. At least the sauce is done! Ok, I'm off to watch The Next Food Network Star and dream about my future gig as the Gluten-Free Gourmet.